Pride in Porthleven (PIP) is seeking volunteers to help clean and paint the bus shelter on Wellington Rd, Porthleven. The aim is to meet on Saturday 19th November at 10am, clean and then paint the shelter. The paint will be supplied by Porthleven Town Council. If you can, it would be great if people could bring a dust/paint sheet, paint brushes and rollers. The good people at Helston and Lizard Works will be giving a hand too. Another PIP meeting and clear-up took place on Sunday morning. The targets for the groups clean up was Horseshoe Playing Field, also known as top park. A few new people turned up, including a few children. Well, one did not have a choice, as that child belonged to me. In 40 or so minutes just over 7kg of rubbish was picked up from Shrubberies Hill car park and Horseshoe Playing Field. An added bonus was the weather was sunny. So far, 17kg of rubbish has been collected in the litter picks and near a tonne from the Harbour. On Sunday 11th September at 11 am PIP (Pride in Porthleven) is planning to meet again. This time the plan is to clear up Horseshoe Playing Fields, Shrubberies Hill and then along St. Peters Way. All PIP is asking for it an hour or so of your time to help clear up these areas. Yes, it is called Horseshoe Playing Field. 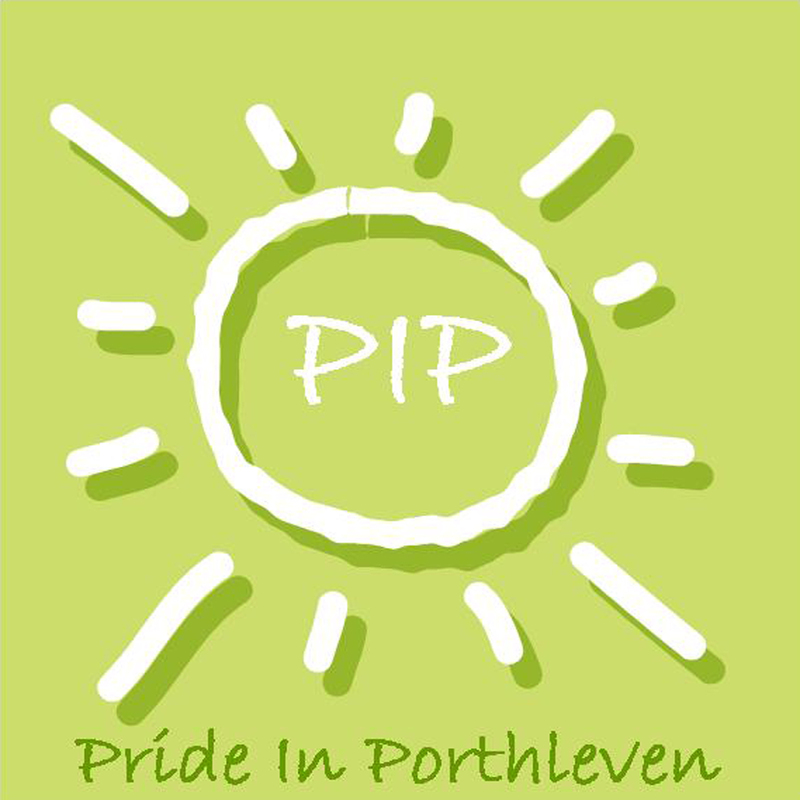 On Saturday 6th August the first official meeting of PIP (Pride in Porthleven) took place. The plan was to litter pick around the harbour before the annual Lifeboat Day and in and around The Moors playing fields. In 90 minutes of work around 10 kg worth of rubbish was picked up. 10 kg might not seem much, but it is, considering most of the rubbish collected was cans, paper, crisp packets and other lightweight items. Some of the PIP group. An added bonus to the litter pick is people came up to various members of the group saying well done, and asking for further details on how to take part. It was not just local people who approached us, but visitors too. It was nice to hear them commenting on how clean Porthleven looked and it was good to see the community helping to make it look nice. This is a good impression to make, because these visitors will go back and tell others that Porthleven cares about how it looks. There will be another PIP event in early September and the plan is to do other parts of Porthleven. If you fancy taking part, or suggesting areas that needs to be cleaned drop me or Demelza an email, and I will put you on a mailing list for future events. A special thanks should go to those who helped, as without them, this would not work. After the success of the harbour clean (1 Tonne of rubbish collected) in some pretty poor weather, and the discussions after; I am pleased to announce the formation of Pride in Porthleven, or PIP. The plan for PIP is to meet once a month for a few hours and help clean up an area. 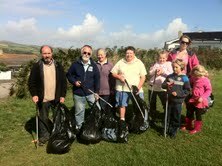 It could be a litter pick or another small job, but the aim of the group is to make Porthleven look better for everyone. We can all sit back, moan and wait for the council to do the work, but that never solves the problem. I hope PIP will be a success, but it will only work if people give their time to this community group. The first meeting/event will take place on Saturday 6th August at 11 am; meeting at the harbour head. The plan is to do a litter pick around the harbour before Life Boat Day (Sunday). Last Saturday a harbour clean organised by Porthleven TC and The Harbour and Dock Company took place. 10 people turned up, which was good because the weather was awful. In just over an hour eight black bin bags of rubbish were collected from the harbour. After the clean-up had taken place, a discussion started about cleaning up other areas of Porthleven. One of the group had previous experience of this sort of activity. That group was call Pride in Portishead, or its short name PiP. Everyone present thought the name was great as Porthleven could be substituted for Portishead. I now will be looking at setting up a PiP for Porthleven that will meet roughly once a month to carry out small tasks in Porthleven. I hope it will be in-conjunction with the Town Council, Harbour and Dock, other organisations in Porthleven and most of all, the public. If you fancy taking part email, or phone me expressing an interest.